Perhaps, long shrugs could unarguably adorn every wardrobe and it doesn’t matter Whether you are a modest dresser or not. Long shrugs have always been an obvious choice when it comes to layering.You could team it up with shorts. Crops, tights, blouses and tees. The flair of layering keeps improving with one’s improvised sense of inherent style. To reinstate the point further Modest shrugs are a hit with Modest dressers owing to its flexibility of covering up conservatively as well as doubles up as an over garment to con any skimpy or non-flattering dress. The South East Asian labels and fashion houses have also made this latest fashion fad a favorite troupe in their ethnic creations. For Instance, you have Pakistani Designers experimenting with shrugs as robes teamed with straight pants and salwar tunic/ blouses. The fabrics used in such shrugs also ranges widely from charmeuse, cable knits, georgette to mixed ribbed fibers and woolen knits in colder climate. 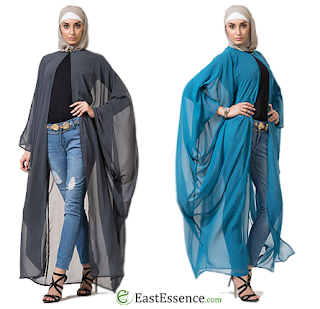 There’s no end to myriad styling ideas as one can easily scroll through Pinterest or Instagram to get creative.The long shrugs have been particularly important to the Muslim ladies also as it to a large extent compensates for the need of longer tunics or shirts as mandated to perform successful Salah. 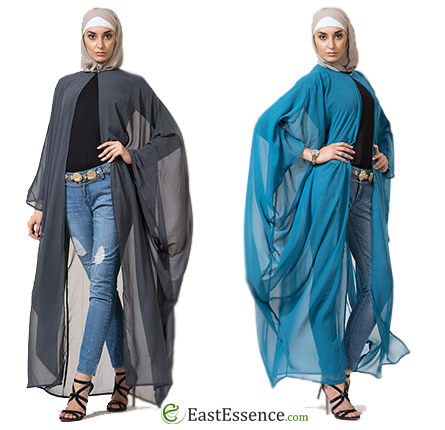 It also offers alternate versions of styling your dresses or Abayas and has lately become a popular trend in the Middles eastern fashion circuit as well as in Turkey. Those long shrugs are also a major hit with women of larger body frames dressers as they help to cover up the extra bulges and love handles. Many women with a curvy body frame take to this easy style tip to dress sharp. Women shrugs are also found in many alluring colors with rich embellishments, embroidery or cut works and pattern to suit and befit a range of body -types and tastes which rings differently with different ethnicities, regions, continents and cultural preferences. Shrugs have also been modified with different styles to accommodate a range of other utilities like long shrugs with a hood as an Islamic alternative for fitting tracks or shrugs with pockets or a tie to add the fancy.